While threat intelligence can transform an organization's security posture, it can also be complex and costly for organizations to adopt and operationalize. With that in mind, SANS Analyst Dave Shackleford tested CrowdStrike Falcon XTM threat intelligence and the report of his findings is now available. Falcon X enables cybersecurity teams to automatically analyze malware found on endpoints, find related threats and enrich the results with customized threat intelligence. 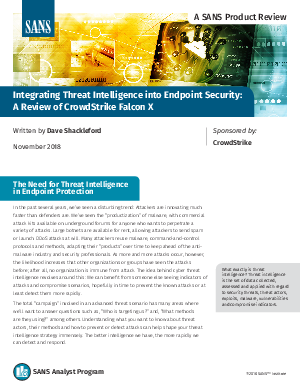 The SANS Review of Falcon X encapsulates and explains the analyst’s findings and details how CrowdStrike can help your security operations center (SOC) team make predictive security a reality.